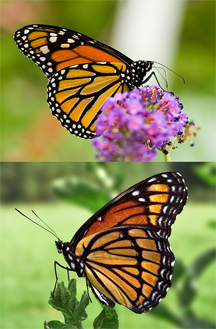 Monarch Butterfly (Danaus plexippus) (top), and a Viceroy Butterfly (Limenitis archippus), a Monarch mimic (bottom). This form of mimicry is known as Müllerian mimicry. It arises when a single predator species preys on both of the mutually mimicking species, both of which are noxious or toxic to the predator. Evolutionary convergence arises from the predator's learning to avoid the two species. In deceptive communications, flawed metaphors are a form of mimicry. The deceiver uses a metaphor to trick the target into making an identification between the metaphor and reality. In our example, the deceiver wants the target to remain tranquil in spite of revenue declines — that is, to turn his or her attention elsewhere. The deceiver accomplishes this by using a metaphor to make the revenue declines, which could be just the beginning of serious trouble, appear to be much less serious. Photo of Monarch by Richiebits, courtesy Wikipedia. Photo of Viceroy by PiccoloNamek, courtesy Wikipedia. Viceroy photo published under the GNU Free Documentation License, Version 1.2. Used responsibly, communication is our method for constructively propagating ideas within and among groups, for testing those ideas, for selecting the most promising ones, and for making decisions about adopting them. Communication can also be abused to persuade organizations to adopt policies that benefit their advocates more than they benefit the organization. Deceptive communication is one technique of communication abuse. It is any intentional action (or inaction) associated with communication that creates advantages for the deceiver by causing others to adopt or retain false models of reality. Lies are one common example. But there are many much less obvious methods of deceptive communication. Here are three. Because metaphors are approximations to reality, some deceivers use metaphors to distort the target's thinking. One example: "Second quarter results suggest that we've hit a speed bump." Using this metaphor could be deceptive because it suggests that the slowdown is small and its duration short. But when you first encounter a speed bump, you can't really tell how long it will last or how big the bump is. Maybe it's actually a warning curb right in front of a brick wall thirty feet thick. The speed bump metaphor thus conceals the issues of severity and duration of the revenue decline. Similar tricks are possible with analogies. Unless we think very carefully about the metaphors and analogies deceivers use, we're likely to be deceived. less obvious methodsto identify as deceptive a communication that's known to be deceptive. Less egregious, perhaps, is identifying as deceptive a communication that one isn't certain is deceptive, without revealing the uncertainty, as is failing to identify as potentially deceptive a communication that one strongly suspects is deceptive. Pace of speech varies from person to person, and time to time. Occasionally, a speaker's pace is so slow that impatient audience members, unbidden, complete the speaker's thought. When this happens naturally, it can be a sign of a group working well together. But deceivers who wish to avoid explicitly stating something inflammatory or accusatory can slow-talk to exploit impatient audience members, who then "pick up the ball" and run with it. In this way, the slow-talking speaker avoids saying anything that could later be regarded as a violation of decorum or ethics. The technique is especially valuable when the unspoken thought is an accusation that the slow-talker knows to be false. Would you like to see your comments posted here? rbrenOPIWOEcSTGzWFyvLner@ChacqwRhkrZVVWFsLOHXoCanyon.comSend me your comments by email, or by Web form. As with technical debt, we incur management debt when we make choices that carry with them recurring costs. How can we quantify management debt? Many complain about attending meetings. Certainly meetings can be maddening affairs, and they also cost way more than most of us appreciate. Understanding how much we spend on meetings might help us get control of them. Here's Part III of a survey of some less-appreciated costs. When solving problems creates new problems, or creates problems elsewhere, we say that problem displacement has occurred. Sometimes it's intentional. An arrogant demeanor is widely viewed as a hallmark of the narcissist. But truly narcissistic arrogance is off the charts. It's something beyond the merely annoying arrogance of a sometimes-obnoxious individual. What is narcissistic arrogance and how can we cope with it? I offer email and telephone coaching at both corporate and individual rates. Contact Rick for details at rbrenFBnMIvrmAdRHXtWyner@ChaceXItcplYJHTYtcgJoCanyon.com or (650) 787-6475, or toll-free in the continental US at (866) 378-5470.